3km of pathway in total. Arrina - Cuaig: this links the car park area in Arrina wood to the existing path from Cuaig which is a traditional non-constructed hill path way-marked with stone cairns. 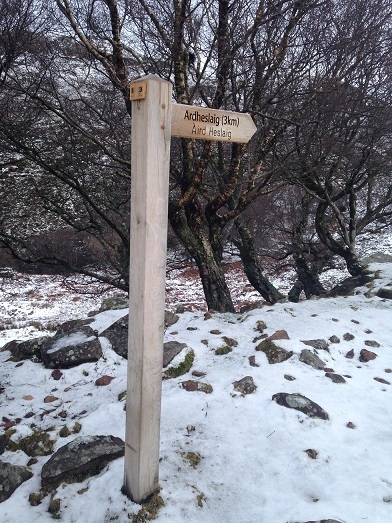 ALPS has reinstated the Cuaig path for the use of walkers across the peninsula, and sensitively waymarked the route. Ardheslaig – Kenmore: this existing path has been largely unused since it was severed by the public road. This project has allowed for reinstatement of the existing path and creation of new path, providing pedestrian access to the townships of Kenmore and Ardheslaig. Much of the path follows the edge of the land as it meets the coast and so offers spectacular views over the water. The great benefit of these paths is that they link up with the Kenmore Path to provide a longer walk or bike ride, and allow access to an area that was previously inaccessible.